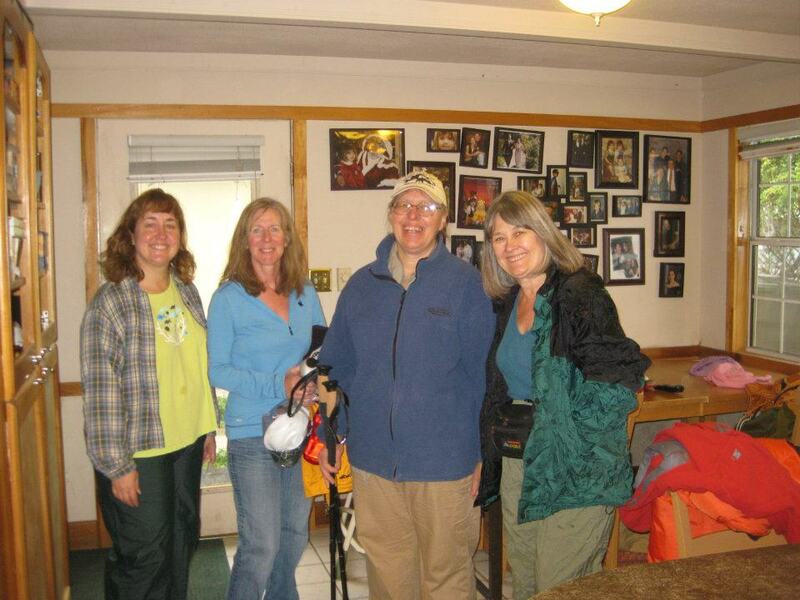 So there we were at the trailhead with Gordon, the Park Ranger. 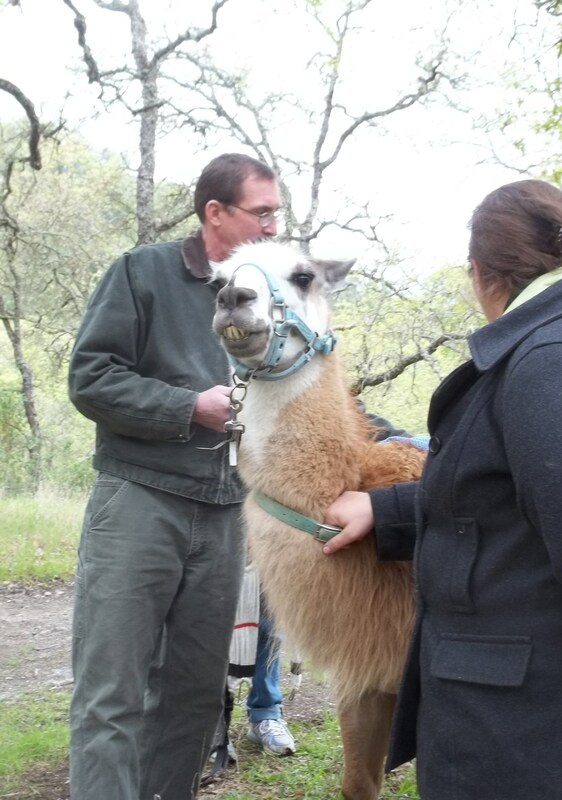 He looked a little dubious, but he was also very interested in the process of loading three llamas for a three day hike on the Ohlone Wilderness Trail. And it is quite a process, although my friend Emily has it down to a science. 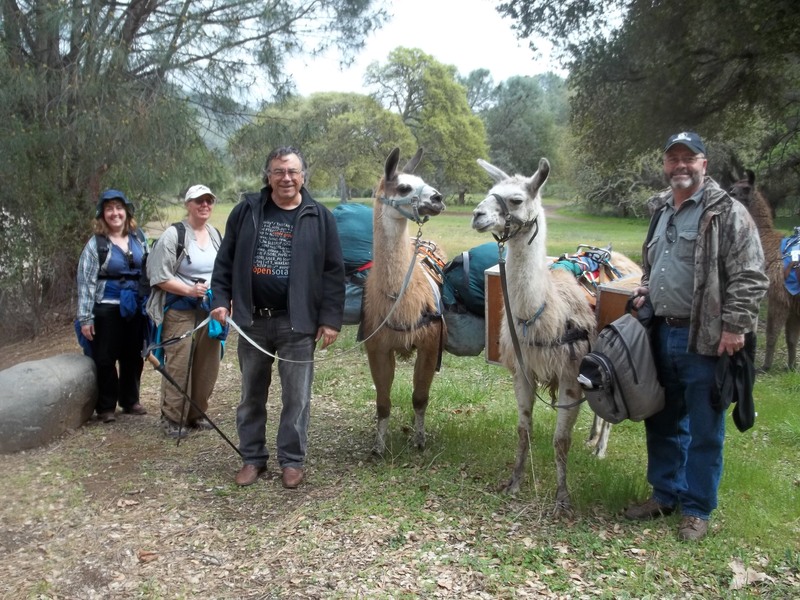 She has led pack llama excursions for about 25 years. The most important thing is to distribute the load evenly on the animal’s back, so we carried along a handy hanging scale to weigh the packs when we were loading them. As little as a pound of uneven weight can be uncomfortable for a llama. Each llama can carry about 75 pounds. That’s the nice thing about llama-packing. You can bring a lot of luxury stuff you can’t take on a regular backpack trip. We had bagels, lox and cream cheese for breakfast. Our dinner was fresh chicken and vegetables one night and shrimp with Cajun beans and rice another night. No dehydrated soup mix. 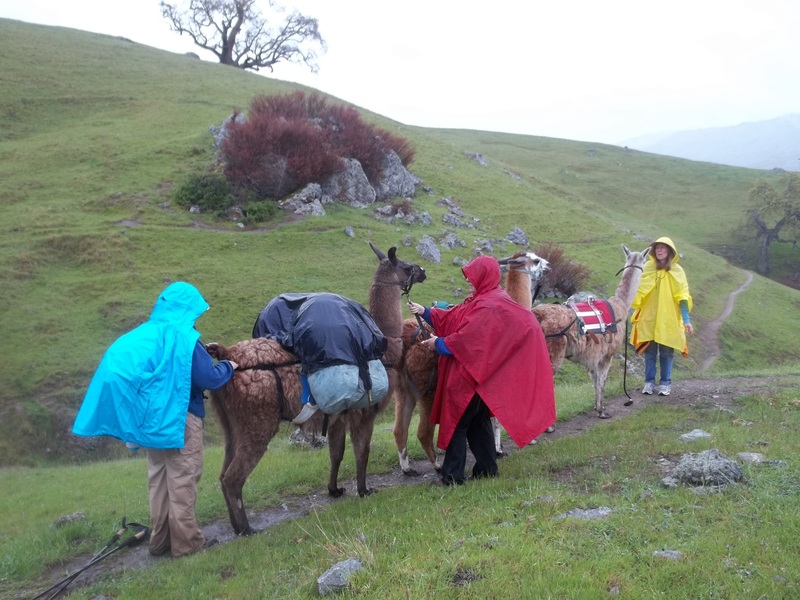 And the llamas do most of the work while we just stroll along carrying our personal things in light day packs. The two younger llamas, Inca and Patches, carried most of the load. Seventeen-year-old Josh helped out a little, but the old herd boss has worked hard on dozens of pack trips over the years, and this trip was mostly to give him a fun outing in his old age. 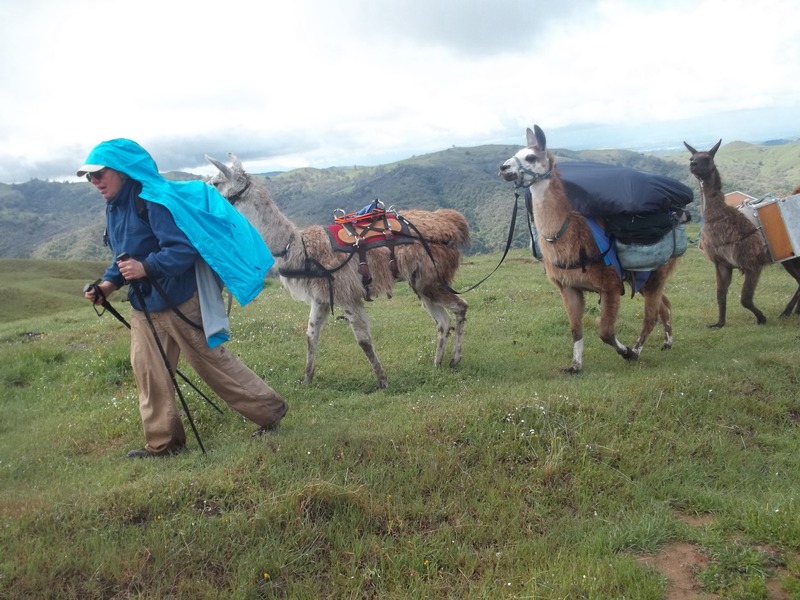 Llamas are very social, and they’re great team players, so Emily and Kathy also hoped the old gentleman would be a good teaching influence on young Inca, who had never been out on the trail before. 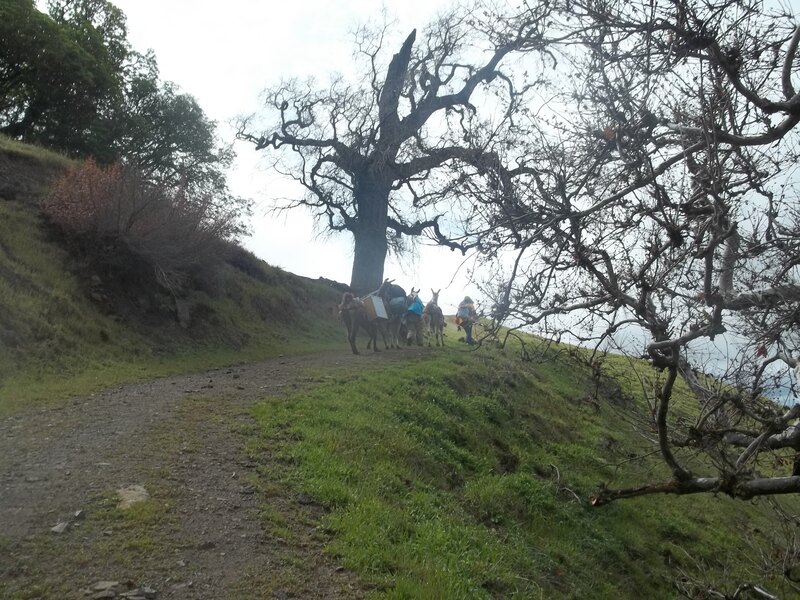 We hooked the three llamas together in a string, with Josh in the lead, and started up the trail. Take note of the word, UP. Looking at the topographic map – although I didn’t really know much about topographic maps – we knew there would be lots of ups and downs. Strangely, it seemed that there were more ups than downs. 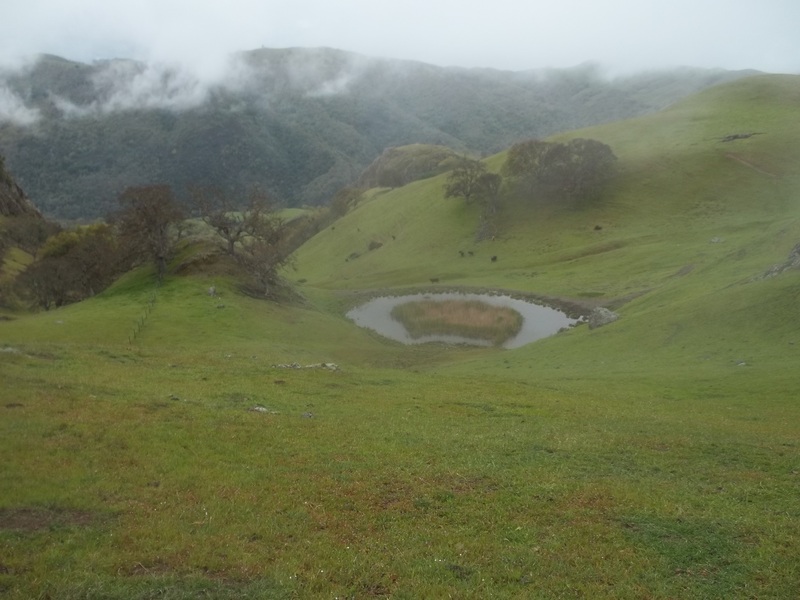 The Ohlone Trail is 28 miles long, with over 8000 feet of elevation gain/loss. Our hike would cover only 15 miles, but with all the elevation you could wish for. Robin’s dad was the park ranger years ago, and it was he who actually laid out the Ohlone trail. Trudging up some of those perpendicular slopes, we had some choice comments for him. Apparently the man did not believe in switchbacks! In my last blog I talked about how Robin, as the park ranger’s daughter, lived in a wilderness cabin when she was a little girl. They had no electricity and her mother cooked on a wood stove. They lived a rugged and adventurous life, and Robin said that the lives of her friends in the city seemed sort of flat by comparison. “Well, there will be nothing flat about this trip,” we assured her. “The Lord has a sense of humor!” We trekked up and down the hills, ignoring the spattering raindrops, and tried not to think about the thunderstorms in the forecast. My friends’ red, blue and yellow ponchos billowed brightly in the breeze. I didn’t have a poncho, but I was perfectly dry and comfortable in John’s hunting rain gear. How I appreciated it — especially his warm down vest — although I know I looked a lot like the Michelin man. The first day we had scattered showers and a little wind. It wasn’t bad walking weather until around 4 pm, when it began to pour. We knew we wouldn’t make it three more miles to the designated camp site, so we decided to set up the tent on a wide part of the trail, and take shelter just until the rain let up. 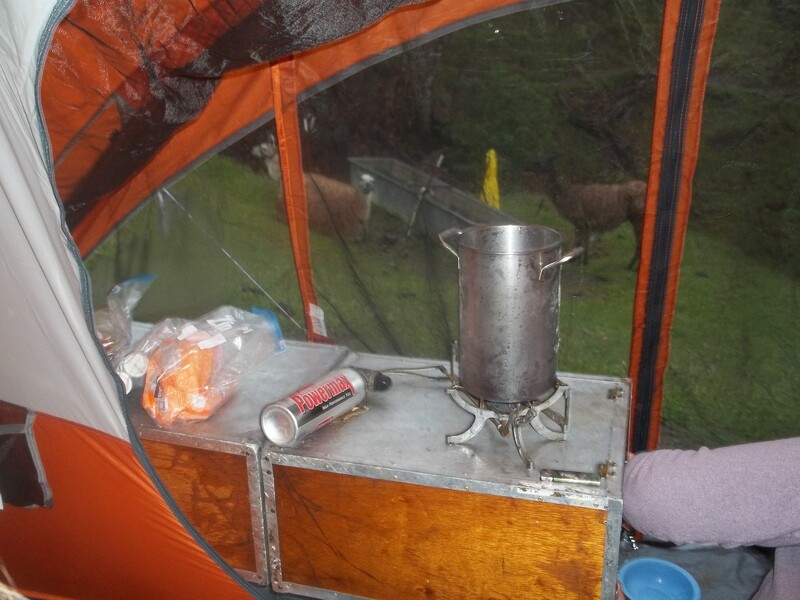 We sat in the tent laughing and changing into dry socks and rummaging for something to eat. 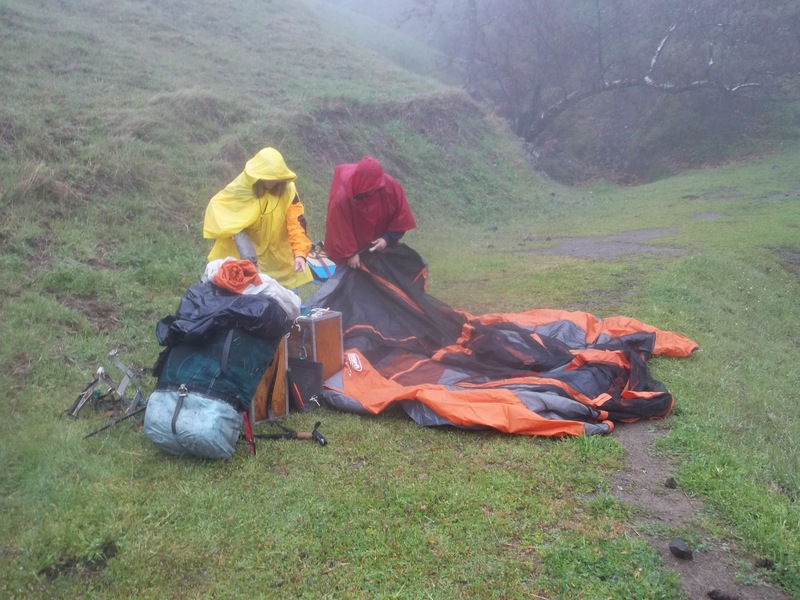 We had just set up the little back-pack stove in the vestibule of the tent to boil some water, when we saw the last thing we expected to see – two men walking up to the tent. 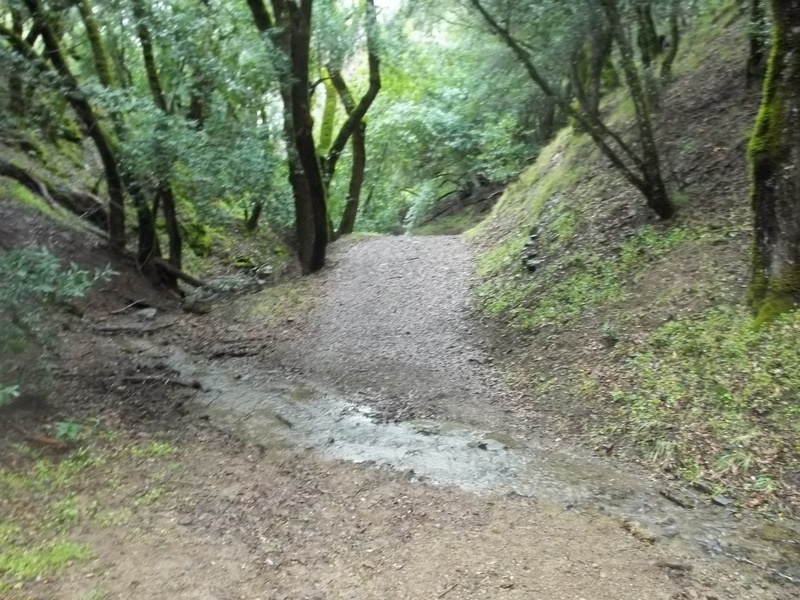 The men were drenched and distressed, and asked us if we had passed a woman on the trail. They had been searching for her for hours and their cell phone battery was now dead. We told them we hadn’t seen another human being all day. We got out our map and figured out our location, and Emily gave them her cell phone to call the Park Service and 911. We also invited them to pray with us, that their companion would be found, and that she would be unhurt. They seemed to be caught off guard by the idea of praying, but they were willing to join us. By then the water was boiling, so we made dinner and shared it with them. Finally, it was getting dark when the Park Ranger arrived. He told us we should stay camped where we were, and he told the men to return down the trail to the place they had camped earlier in the day. The park personnel would search for the missing woman. He said he didn’t want any more people getting lost on such a night. For the remainder of our time on the trail we thought about the lost woman and prayed for her when we thought about her. In a happy postscript I’m delighted to say that Emily got her phone back the Tuesday after our hike. The man mailed it with a very gracious letter telling us that their hiking companion was safe and how much they had appreciated the phone, the food and the prayers. No, it was not a flat adventure. One night it was so windy I really was afraid the tent would blow away. The side of it was flapping so wildly it was coming down and hitting my face with wet smacks. I lay there praying and trying to remember where I had stashed my glasses. As I pictured all of us stumbling around lost and blind on the storm-tossed mountain, I called to mind every scripture I ever read about the Lord’s deliverance. The next morning dawned glorious! It was blue-skied and bright, with magnificent cloud shadows on every slope. We saw mist hanging in the hollows of valleys, and enchanted vistas we would never have seen if it hadn’t been for the rain. Then that afternoon the sky darkened and it began to hail. 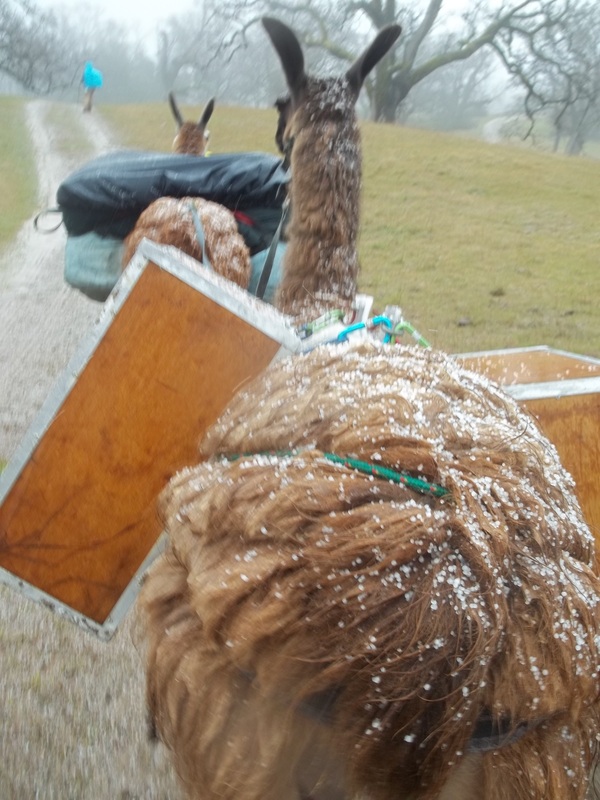 Hailstones the size of peas piled up on the llamas’ backs as we walked dismally along. After some time of walking, we decided to set up the tent and wait it out. Sure enough, after a couple of hours and a nice nap, the weather cleared and we were able to pack up and hike to the next designated camping area. By the third day both pairs of my shoes were thoroughly soaked. I learned the trick of lining them with plastic bags to keep my last pair of socks dry. By that time the storm had spent itself, and the day was stunningly beautiful. But we were so tired! We trudged along singing every song we could think of to keep our spirits up for that last mile. At Del Valle, our husbands would be waiting to pick us up and take us back to a nice flat life with electricity and bathtubs full of steaming hot water. Categories: Animal Tales, While Walking... | Permalink. Welcome! My name is Andrena Paladini and this is a blog about family and love and faith and fun. I call it Paladini Potpie because a potpie is like an adventure in a crust. You never know what might come up, but it’s always going to be good! Think of the best potpie you’ve ever eaten…hot flaky crust holding a rich savory sauce and all kinds of pieces of meat and vegetables…and who knows what? As a family, we’ve chosen to live within the parameters of God’s love and protection. This is the crust of our Paladini Potpie. The crust never changes. Within this crust, the savory sauce of family love binds it all together. That is also fairly constant. But beyond the crust and the sauce we can add just about anything! Good ideas come our way and we’ve adopted and adapted them to add to what John calls our treasure box of memories. These stories and ideas from John’s treasure box of memories are the ingredients I’m putting into our Paladini Potpie. (Okay, so this ridiculous mixing of metaphors about treasure boxes and potpies is exactly what I’m talking about. Silly and ungrammatically correct. But both illustrations work… so we’ll mix them together and it’ll be just fine!) John and I have been married for 30 years. Our children have wonderfully doubled in number since David married Amanda, Monica married Dan, and Matthew married Sarah. And the newest little treats that have been added to our potpie are six adorable grandchildren - Ethan, Angelina, Nathan, Audrey, Maleia and Caleb! I hope you’ll subscribe to my Paladini Potpie blog, and keep up with all the fun new ingredients I add. Hopefully you’ll enjoy our stories and ideas, and find something you’ll want to put into your own potpie! Bon appétit!